Monday. Time for another Beer of the Week! I tend to think it’s just a coincidence that I’m strategically reviewing a beer after the weekend, but really, I tend to think any day is a good day for beer! Also, I just discovered that I now have 2 readers! Welcome! I’m very excited to have you, and hope you find (or share) some nomable treats. Today’s beer comes to you courtesy of the Deschutes Brewery in Bend, Oregon. Weirdly, as I was browsing through bon appetit, the grilling issue, I cam across a story of love and betrayal beer. Apparently, those good German beer lovers are drinking a summer brew…for summer. 🙂 This is a shocking national departure from hefes and pils, enough so to make what passes for international news in the food world. The summertime beer of choice would be…go figure…summer ale (called Kolsch in German-speaking circles). Wow I thought, with mental gears screeching so loud I was sure that the checker could hear…I’m trendy!!! 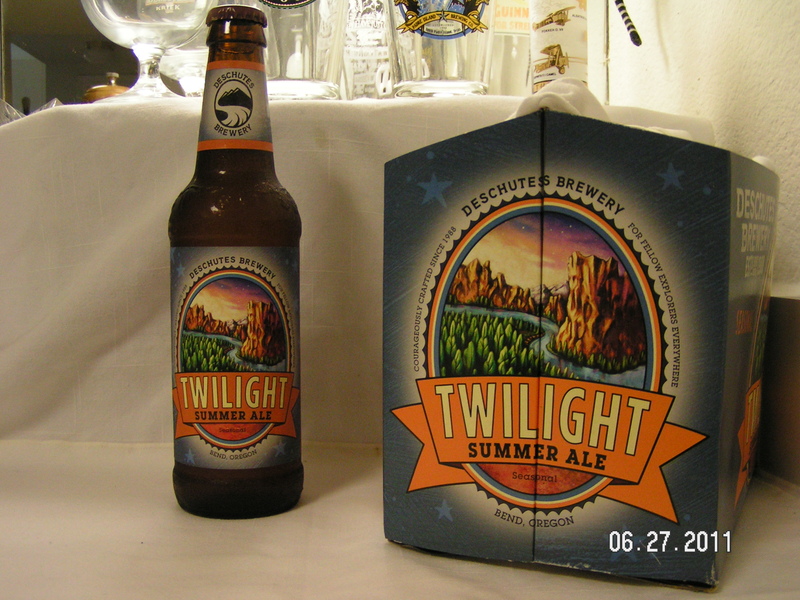 Twilight, the beer not the movie thankfully, is light and easy to drink in the summer heat while still retaining its ale-ishness. It’s not fruity, but instead has a nice hoppiness…however, not so much as an IPA or winter ale. The label touts the use of Amarillo hops, though I’m not sure what the difference is, the beer is delicious! It’s drinkable on its own, or paired up with some nice mixed grill of the beefy variety. Twilight has a balanced bitterness, not lacking at all in flavor and fragrance, but retaining a crisp bite. Cold is good, and lukewarm is actually better, which is great for the heat of Texas summertime of tripple digit weather. So whether you’ve just finished mowing, grilling, or energetically lazing around the poolside, I’d recommend this ale. It’s definitely a winner! Hopefully, I can go all summer without tasting a beer I don’t really care for. Prost! Thanks for the tip. Sounds like something I’d like to try. I’m taking a break from brewing my own for the summer, so any pointers toward something new (to me) are appreciated. That sounds awesome. I loved German Kolsches, and would imagine this one is a nice take.